Beware the Ides of March — good advice perhaps for Caesar, but the warning did not apply to Judy and me. We drove 75 miles west to Cane Creek Canyon Preserve, arriving at Jim and Faye Lacefield’s Preserve entry home at 10:00 AM, right on schedule. Our day had dawned at 25 degrees, and already under brilliantly blue skies had climbed into the upper 40s. Two months earlier we had scheduled what proved to be a perfect weather day. Jim had hoped to catch the spring wildflower season at early peak. The day did not disappoint; we recorded 23 different species in flower! Most of the road trip found us south of and parallel to the Tennessee River, the first 20-plus miles west of I-65 mostly industrial and agricultural flood plain and terrace. Relatively flat the full distance, we turned south about ten miles from the Preserve, immediately ascending 200-300 feet onto the plateau through which Cane Creek has carved its canyon at the Preserve. 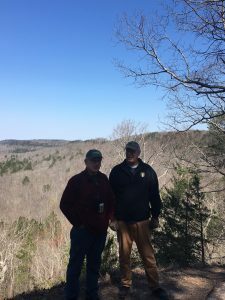 Here we stand at nearly 800 feet elevation, some 300 feet above the creek behind us to the north. The Preserve encompasses some 800 acres, including most of what lies within view. Jim and Faye have acquired the acreage in several parcels over three decades. 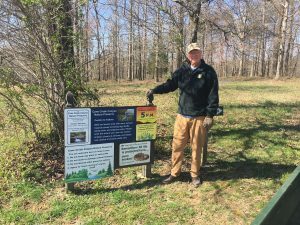 The Nature Conservancy now holds the property in permanent conservation easement. 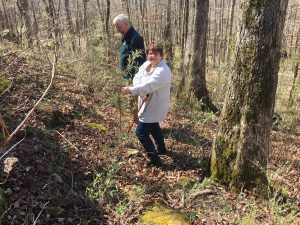 The Friends of Cane Creek Canyon Preserve assist Jim and Faye in their remarkable stewardship of this treasure. Eighteen miles of marked and maintained hiking trails. Great maps. Tree identification tags. The whole package made all the more impressive by Jim and Faye. We had not met them except by email, yet we left late afternoon feeling as though we had know them for years. Because the Preserve attracted many visitors that day, Faye departed our tour after an hour or so to attend to their many guests and the sign-in/registration booth at the trail head. Jim stayed with us some six hours. He drove us over many miles of trail courtesy of his brother Joe’s ATV. The two Lacefield ATVs were shop-bound for spring reconditioning. Jim and Faye are retired school teachers. Enthusiastically fit, unabashedly passionate about Nature and the Preserve, and knowledgeable beyond compare. Having spent much time with him on-site, I describe Jim as a Nature Renaissance Man. He authored Lost Worlds in Alabama Rocks: A Guide to the State’s Ancient Life and Landscapes (Alabama Museum of Natural History, 2013). Jim knows more than geology and geomorphology. His knowledge extends deeply across spring ephemerals, woody shrubs, and trees — common and Latin names all! He referred with similar familiarity to every butterfly we saw. Even with a PhD in forestry, I view Jim with absolute inspiration and humility. He and Faye are one with the land they know and love. I cannot do justice to the extent of my awe for Jim, Faye, and the Preserve in this single blog post. 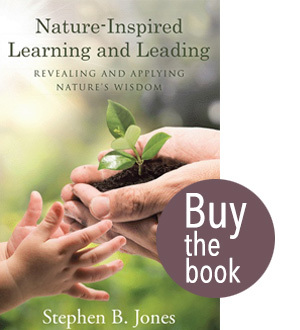 I will note that they epitomize Nature-Inspired Learning and Leading. They are exemplars. I left that afternoon feeling great admiration for their selfless stewardship of 1.25 square miles. 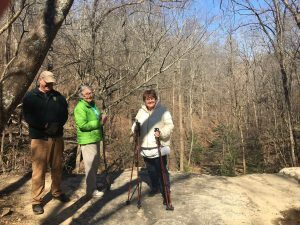 Rather than attempt to capture the full Cane Creek Canyon tale in this single post, I will give you a broad overview, first impressions, and initial reflections today, based upon this inaugural tour. I’ll include some lessons from Nature that I draw from what I hope is the first of many visits. Within the next week or two, I’ll develop two additional posts. I’ll review and highlight some of the flowers we spotted and photographed in a post I’ll call Spring’s Richness. Then I’ll reflect upon how we saw so much magic in life’s miraculous ken for finding anchorage and sustenance in some unlikely places (boulder tops, rock faces, and elsewhere) in Finding a Place. I may go to a third sequel, exploring whether there are elements of the Cane Creek Canyon Legacy Story not yet told. Not at all ironically, we found lots of cane along Cane Creek. Judy is holding onto one. In several places the cane grew in thickets, some exceeding ten feet vertical. I’m drafting these words Sunday, three days after our visit. Seeing the photographs accents the memories, yet does not do justice to actually being there. These tough sandstone outcrops send small streams and rivulets down-slope in steps and spills, adding excitement and beauty. I wanted to lean more into the photo (below left); uneasiness with heights dissuaded me. I suppose I could have gone horizontal and slithered to the edge, but I didn’t want to show our hosts the chicken side of my psyche — after all, I had met them just 60 minutes prior! This is the first of many spring falls we encountered. 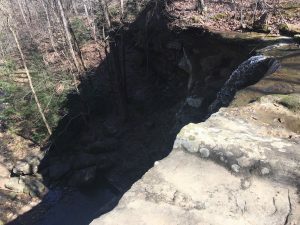 The Friends of Cane Creek Canyon Nature Preserve Facebook page (https://www.facebook.com/Friends-of-Cane-Creek-Canyon-Nature-Preserve-126802417335447/) has lots of photos and videos that capture the real essence of the Preserve’s vibrant stream and waterfall environment. Judy, Faye, and Jim are standing in the second photo about where I snapped the first. I’m sure you have observed that the view from atop a rise (this drop is 30-40 feet or so) always seems higher than standing at the bottom looking up. The applicable lesson from Nature? Perspective matters — where you stand (on any topic or issue) depends upon where you sit. There is no inherent danger in looking up at the ledge. I felt real and palpable risk in leaning forward to take the photo where the stream passed over the edge. Even as I so conclude, I’m reminded that the view from on top is generally superior. That lesson? Exertion yields return. Once Faye had left us, I rode in the back of the ATV, snapping an occasional photo between jostles and bounces. This photo revealed what I did not see. 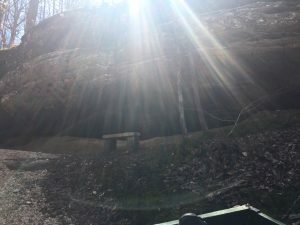 I simply intended to capture the nice bench placed at a ledge overhang along the trail. Instead, the sun’s rays gave this image a sacred appearance, leading me to dub this as The Altar. The entire Preserve expressed an ethereal character. I felt the spiritual in multiple places that day. Too, I sensed in Jim and Faye a connection to the land of a sacred nature. They do obviously love the land and draw as much from it as they give to it. 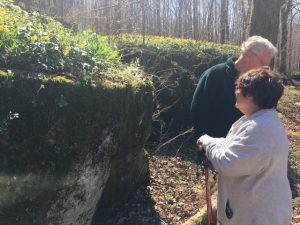 I’m reminded of Aldo Leopold’s remark about caring for the land, “We can only be ethical in relation to something we can see, understand, feel, love, or otherwise have faith in.” I feel certain that Jim and Faye are guided by understanding and love for the Preserve, which is itself in whole an altar of sorts. Life and beauty are where you seek it in early spring. Our humid temperate climate encourages moss, in this case along the upland brook not far below the falls in the earlier photo. As spring advances and multiple shades of green overwhelm the landscape, the moss will not draw our attention so well. In mid March, it speaks loudly and convincingly, commanding its audience. We will watch for its more subtle expressions as summer approaches. The Boulder Garden, a tumbled collection of sandstone blocks broken from ledge-rock outcrops above, warranted close-up inspection. Each block is a table-top garden, lush with herbaceous and woody plants. We’ll look more closely in a subsequent blog post. 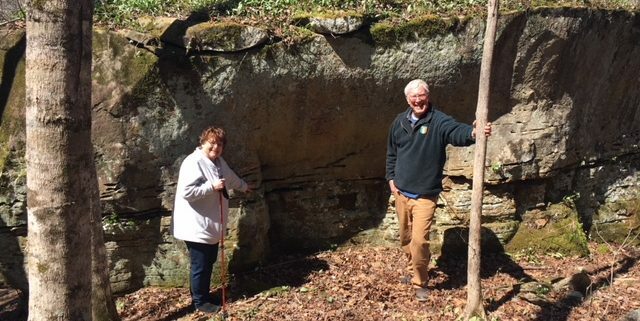 Had even the Master Gardeners among us been assigned a bare 8 by 12 by 12 foot block of sandstone and instructed to create a rock-top garden, we would most assuredly have failed. Yet Nature has succeeded on her own. 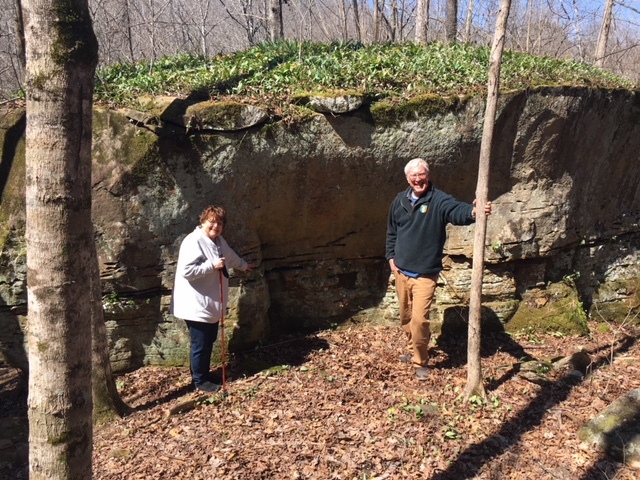 Jim describes this sandstone as a sponge, porous enough to hold moisture available to the individual plants perched there. No, this is not beauty on the Grand Canyon scale, yet it is, just the same, marvel-quality and worthy of appreciation, contemplation, and embrace. 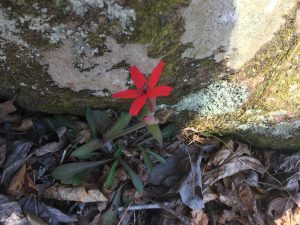 University of the South biologist David George Haskell visited a square meter (his mandala) of old growth Tennessee upland forest floor nearly every day over the course of a calendar year, monitoring the ebb and flow of daily and seasonal life. From his journal, he authored The Forest Unseen. He asked, “Can the whole forest be seen through a small contemplative window of leaves, rocks, and water? I have tried to find an answer to this question, or the start of an answer.” I suggest that the Boulder Garden begs a similar question, “Can the whole of Cane Creek Canyon Preserve be seen through a small contemplative window of sandstone boulders carpeted with the lush growth of spring greenery and flowering splendor?” I suppose that the Boulder Garden provides an answer of sorts, but instead of providing the answer, I think it composes one chapter in a book of such contemplative windows. The oak and rock union below is another chapter. Imagine the acorn cached by a squirrel just below the outcrop. The acorn sprouts. 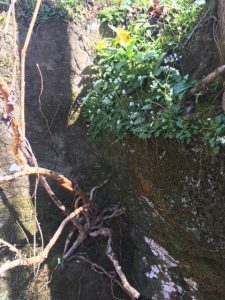 The seedling develops to sapling and extends vertically, finding ample room 8-10 inches from the rock’s reach. All is well until the oak’s girth pushes it into the sandstone. The tree has already found great anchorage, a moist and fertile soil medium, and a place of dominance in the sunlight-rich canopy above. What’s a healthy oak to do? Okay, oak trees have accommodated such interference in prior successful generations; its DNA is prepared. 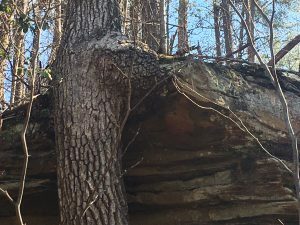 It is equipped genetically to form callous tissue to grow around the ledge (or any such interference), strengthen what would otherwise become a point of weakness, and continue to optimize its unfortunate position where tree meets immovable obstacle. Evolution instructs the tree to thrive at least long enough to produce progeny that can pass life along to a next generation. Isn’t that what oak tree life is all about? The poet Longfellow once remarked, “The purpose of that apple tree is to grow a little new wood each year.” So it is for the oak… and to assure that successor oaks carry its genetic signature forward. 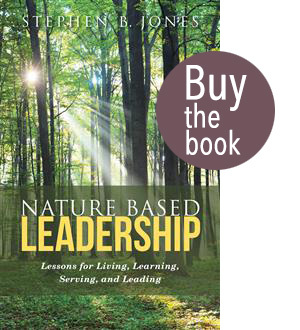 Nature’s lesson for living, learning, serving, and leading? Adapt to the circumstances. Persevere. Recognize that not all of the life and enterprise cards dealt are kings and aces. Employ the tools given us by Nature and nurture. Make the most of it! As I have observed in other Great Blue Heron website posts, I firmly believe that every lesson for living, learning, serving, and leading is either written indelibly in or is compellingly inspired by Nature. Because I believe and I am willing to look, I can see the lessons. I assume they are there, and I find them. How many visitors note this unusual union without understanding what lessons it evidences? 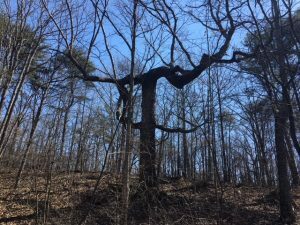 Not far from there, also near the plateau top, this contorted chestnut oak likewise invites the camera shutter. What is its story? I can’t say for sure. I offer one scenario. Picture the pole-sized younger version standing mostly alone perhaps at the edge of a coarse pasture, where the slope steepens abruptly toward the camera. An ice storm heavily drapes it, permanently bending but not breaking the top and upper branches. Those branches continue to function, leafing out, and advantaging the sunlight still within reach. The now more or less horizontal crown branches thicken, support multiple vertical shoots, and perpetuate the now T-topped forest denizen. Meantime, the then-abandoned rough pasture converts to the mixed pine and hardwood forest that extends uphill from the contorted one, clearly a younger age class. A major ice storm can leave an indelible signature. 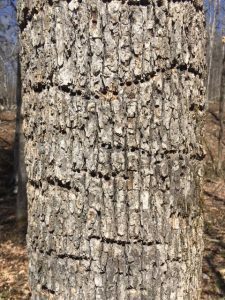 So can a sapsucker foraging for insects on a white oak trunk. Bird peck results. The small woodpeckers continue to work these horizontal lines year after year. I include this photo as just another chapter in the life of the forest, a living community rich with inter-dependencies and intricate beauty. I now offer a confession. I am referring to this tree as a white oak (I also lean toward sweetgum). However, I did not confirm identification in my notes, nor in my memory. I admit that I could be wrong! Throughout the Preserve, I noted 2-4-inch diameter stumps within a foot of the forest floor. Faye had told me that Jim has been dutifully sculpting the forest by shaping the understory, removing individuals he thought should go. This wonderfully descriptive sign informs visitors of the purpose. Again, my compliments to Jim and Faye for so effectively telling the story and educating the visitors. As I reflect on our wonderful visit to Cane Creek Canyon, I recall an apt Wendell Berry quote: “Outdoors we are confronted everywhere with wonders; we see that the miraculous is not extraordinary, but the common mode of existence. It is our daily bread.” The miraculous features at Cane Creek Canyon are indeed not extraordinary, but are the common mode. Nature, in its many variants, is my daily bread. I am certain the same is true for Jim and Faye. I am grateful that Nature enthusiasts like the Lacefields have taken giant steps to make this small corner of the world better through wisdom, knowledge, and hard work. They are Earth Stewardship warriors. Again, I am both humbled and inspired by the Preserve and its intrepid magicians who have dedicated their lives to its care and conservation. May they and the Preserve continue to delight and inform visitors in perpetuity! 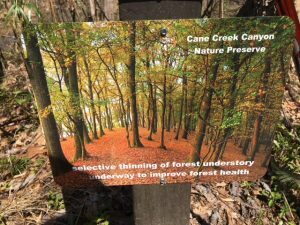 Watch for at least two more posts from our Cane Creek Canyon Preserve visit. In Spring’s Richness we’ll address the nearly two dozen species of blooming plants that greeted us. 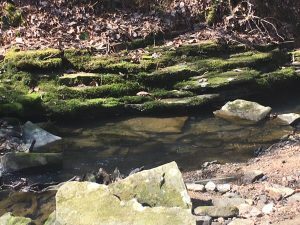 Finding a Place will explore Nature’s way of furnishing anchorage and sustenance in the most unlikely of places… right there at Cane Creek Canyon. Both essays will be rich with Nature’s lessons for living, learning, serving, an leading.